Dr. Gregory Dudek, Anqi Xu, and Junaed Sattar, from McGill's School of Computer Science. 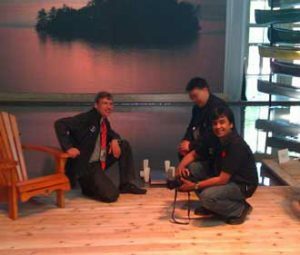 TORONTO – The world’s media is in Toronto this week, and so are Dr. Gregory Dudek and PhD candidates Junaed Sattar and Anqi Xu of McGill’s School of Computer Science. They’re there to showcase their AQUA2 robot, the only one of its kind in the world. A select number of Canada’s most innovative companies are at the G8-G20’s International Media Centre thanks to the Government of Canada, which is keen to underscore the country’s high-tech economy. McGill University was the only academic institution at this event. AQUA2 can do what no other robot can do: it can move about on land and swim and dive in the water. McGill will be at the International Media Centre for the G8/G20 journalists until Sunday, June 27. Although AQUA2 looked at home in the artificial lake at the the G20 media centre, it couldn’t be operated in the water because of the risk of tearing the pool’s plastic liner.